It should come as no surprise that the SUV segments lead in terms of value retention in Germany, in diminishing order of size from SUV-E to SUV-B. Disregarding luxury brands such as Porsche and Tesla, it therefore stands to reason that premium SUVs are the residual value champions at the model level too. But it is not the leading models from BMW and Mercedes that lead the pack - either in terms of value retention or average selling times. 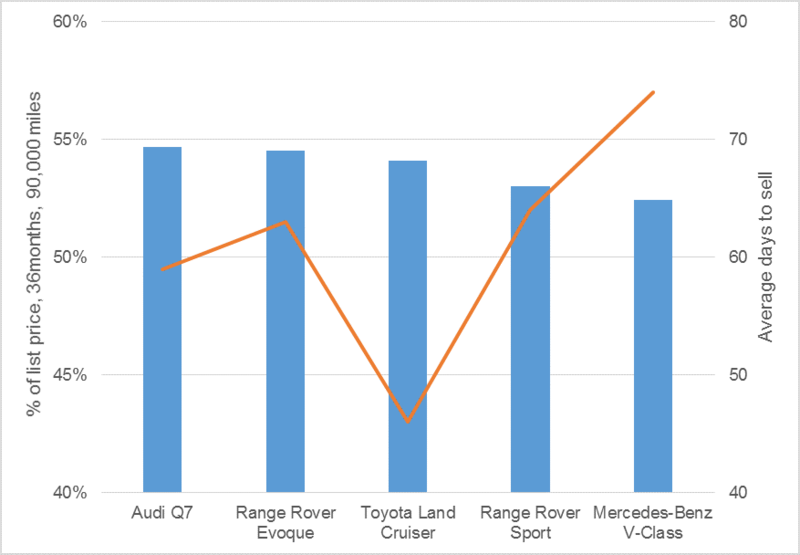 In fact, analysis of Schwacke (the German arm of Autovista Group) residual value data reveals that the Land Rover Defender is the residual value champion in May 2018, retaining a staggering 70% of its value after 36 months and 90,000 km. The Defender is a specialist product which has always commanded high used prices but values have risen even further since production of the model ended in January 2016 after 67 years, limiting supply. Strictly speaking though, the Defender is a niche utilitarian product with a devout following and given that it is no longer in production, it should not qualify in a contest to claim the residual value crown. So, having ruled out the Defender, which premium SUV is now retaining the highest percentage of its original list price in Germany in May 2018? That accolade now goes to the Audi Q7. Values have soared and overtaken numerous contenders in the process as the second-generation model, unveiled at the Detroit Motor Show in January 2015, has become available on the German used car market as a three-year old proposition. The Q7 is closely followed by the Range Rover Evoque as far as value retention is concerned. In third place is Toyota’s Land Cruiser, which also ranks as one of the fastest-selling used cars in Germany, averaging just 46 days to sell. Even though Toyota is regarded as a volume brand, the Land Cruiser ranks alongside premium models such as the Range Rover Evoque and Sport as it has a premium positioning, especially in V8 form, and supply is comparatively limited. Fifth place goes to the Mercedes-Benz V-Class, which is notable in the value rankings as it is the only MPV. In fact, the top ten RV champions in Germany are all SUVs except for the V-Class, which is a slow seller, taking on average 74 days to find a new owner due to its appeal to a rather niche customer base. Sixth place goes to the Volvo XC90, which is enjoying higher residual value retention since the second generation of the model started filtering through as a 3 year-old proposition. Following the XC90 in the rankings are the Land Rover Discovery Sport, Mercedes GLE Coupe, BMW X6 premium SUVs and finally, the budget Dacia Duster SUV. Premium SUVs therefore take seven of the top ten RV places in Germany (eight if you include the Toyota Land Cruiser) but, despite their popularity, analysis of observations data collated by Autovista reveals that they do not count among the fastest-selling used cars. Even the Land Cruiser, the quickest seller among the RV champions, does not make it into the ranking of Germany’s five fastest-selling used cars. Not quite. The ranking of the quickest used sellers in Germany immediately reveals the key role that price plays for used car buyers. 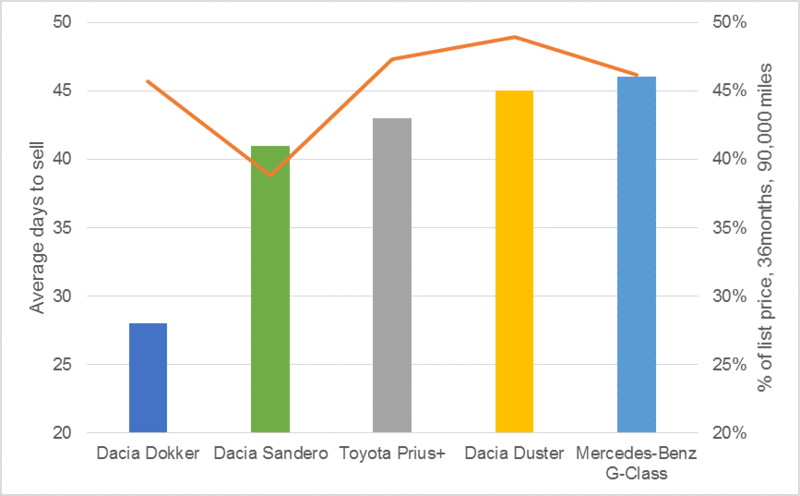 In fact, three of the top five fastest-selling cars in Germany bear the Dacia brand name. The Toyota Prius+ is a notable entry in the ranking of the fastest-selling used cars as, at 47%, it retains eleven percentage points more of its value after 36 months and 90,000km than its Prius hatchback sibling and yet takes on average just 43 days to sell. It should also be noted that the Porsche Macan takes on average just 40 days to sell but is excluded from this ranking as Porsche models are excluded from the ranking of value champions above. Nevertheless, I felt it worth highlighting how quickly the Macan finds a new owner despite still retaining 60% of its value in the 36 month/90,000km scenario. This must be a dream model for dealers although it should be noted that when the Macan first hit the used car market in Germany as a three-year-old model, it was typically retaining 70% of its value. The model may have lost a little of its lustre but the lower used prices it now commands undoubtedly contribute to its quick turnaround. At the opposite end of the spectrum, three of the five highest depreciating models in Germany are electric. However, it must be noted that the value retention of EVs is calculated based on list price and not the purchase price after incentives are applied. Factoring in the incentives available for electric vehicles in Germany at the time of purchase increases the residual value percentage of each by about twenty per cent. 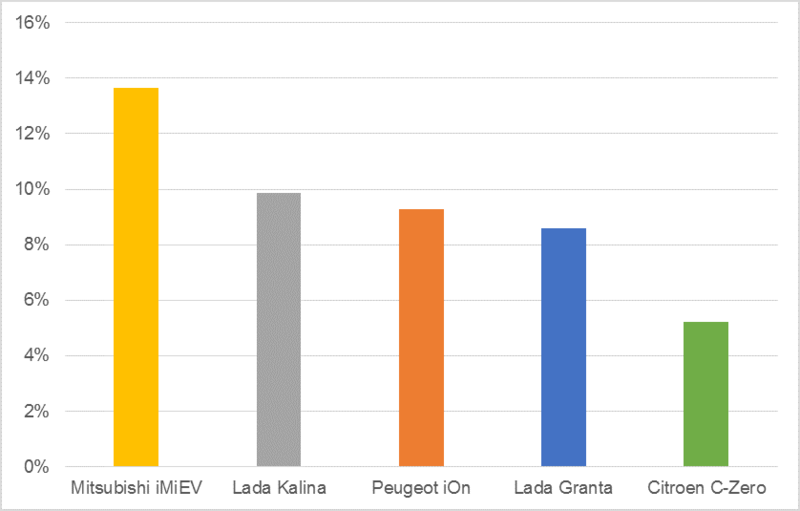 For example the Peugeot iOn would then have a value retention percentage closer to 12% and rank above the Lada Kalina but the worst five performing models remain the same. This does highlight the plight of remarketing electric cars, which are currently only challenged by Lada when it comes to depreciation.